When the Guardians of the Galaxy movie was announced, I too made an announcement: I would refuse to watch in the theaters. It just seemed like a dumb movie. The trailer didn’t impress me. Nor was I familiar with the characters, and apparently many other people weren’t familiar with them either. Familiarity didn’t matter. The movie finished as the highest grossing film of 2014, and the only film of the year to finish with over $300 million in domestic gross. 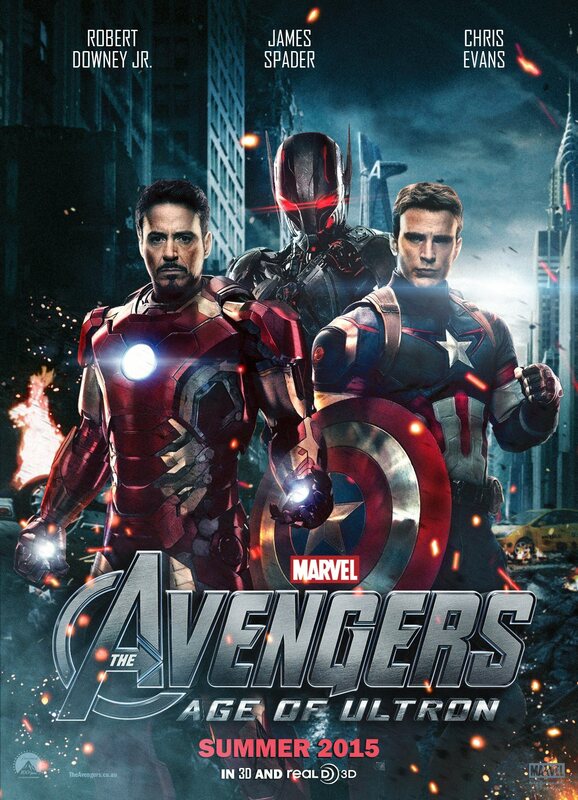 It also was the third-highest grossing Marvel Studios film, behind The Avengers and Iron Man 3. At this point, Marvel Studios could make a movie about Howard the Duck and make millions. Heck, they could make a movie about you and people would flock to the theaters. They have the Midas touch and they know it. 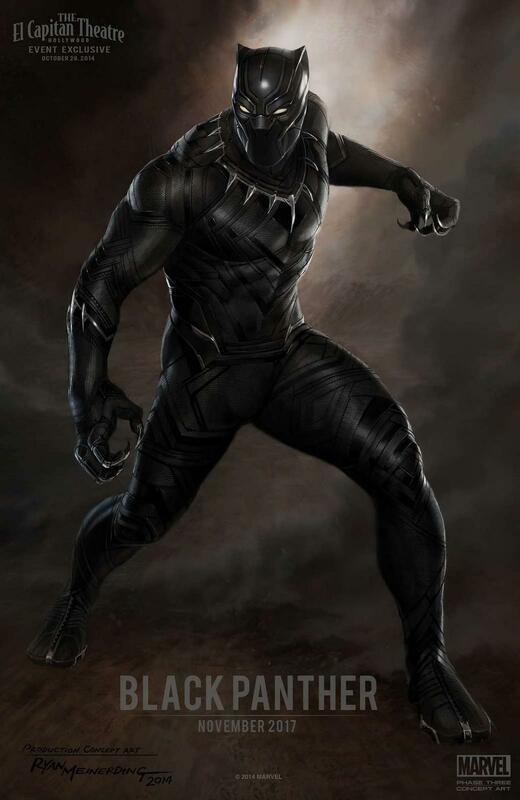 Also, Black Panther will make an appearance the Civil War movie before his solo movie and is rumored to play the “which side will I choose” role that Spider-Man played in the comics version of the storyline (since Marvel Studios doesn’t own the rights to Spider-Man). Also rumored is that the Avengers will team up with the Guardians of the Galaxy to fight Thanos in Avengers: Infinity War. Meanwhile, Sony announced one confirmed Marvel movie of its own: Sinister Six, set to release Nov 11, 2016 (featuring Dr. Octopus, Vulture, Green Goblin, Rhino, Kraven the Hunter, and Mysterio). Apparently, these villains will team up with a re-cast Spider-Man to fight an unknown larger threat. Meanwhile, The Amazing Spider-Man 3, which was originally scheduled for Jun 10, 2016, has been pushed back to an unspecified date in 2018 after the lackluster box office for The Amazing Spider-Man 2. Incidentally, I had been a vocal critic of The Amazing Spider-Man 2 while actors were still being cast, saying it would likely fail due to having too much going on. After watching the film, critics criticized it, saying (surprise, surprise) it had too much going on. Recent rumors that Sony may sell the rights to Spidey back to Marvel Studios. Kevin Feige, Marvel Studios head, did not debunk the rumors, saying rather vaguely that it “is either not true at all or still rumor until it’s worked out.” The fact that Feige did not stop at the former but also added the latter has the internet somewhat abuzz about the possibility of the iconic character joining the studio with the Midas touch. Feige did say in 2012 that “clearly we would prefer everything (in this case, Spider-Man) be at home, so to speak,” and admitted there is “no doubt that Spider-Man is the most well-known (Marvel character),” so the comment about things being “worked out” could be a sign that Marvel Studios and Sony are in some sort of negotiations. Back in 2013, Ain’t It Cool News reported that Sony co-chair Amy Pascal said she would “never ever ever” let go of the Spider-Man franchise. And even though Amazing Spider-Man 2 underwhelmed at the domestic box office, it still earned a very healthy $709 million worldwide, So before Spidey fans get excited at the possibility of Marvel Studios getting its hands on the web-slinger, Marvel Studios would have to fork over a lot of money before Sony is willing to let go of such a lucrative film franchise. I’m staying far, far away from the Fantastic Four reboot—like ebola. I won’t even watch the movie when it comes out on DVD. Casting the white Johnny Storm character with a black actor is sacrilege. Or worse, stupid sacrilege. It’s a MUCH bigger deal than changing Nick Fury to a black character because Nick Fury is a minor character in the Marvel universe. The Human Torch, however, is one of the most familiar comics characters of all time. You don’t change the identity of such a major character. I’m not alone on this minor insight either. Commenter mongoose wrote: “I can only hope that the FF reboot falls on its face so hard, FF2 will be scrapped in lieu of something else (ANYTHING else).” It’s like Marvel letting a woman become Thor—stupid. Oh, by the way, Fox announced a Deadpool movie expected Feb 12, 2016. However, unlike Marvel, DC reportedly does not have a concrete plan for building a cohesive universe through all its various planned movies. Last but not least, Lego Batman gets his own star turn in “The Lego Batman Movie” in 2017, followed by presumably another cameo in “The Lego Movie 2” in 2018. Whew! 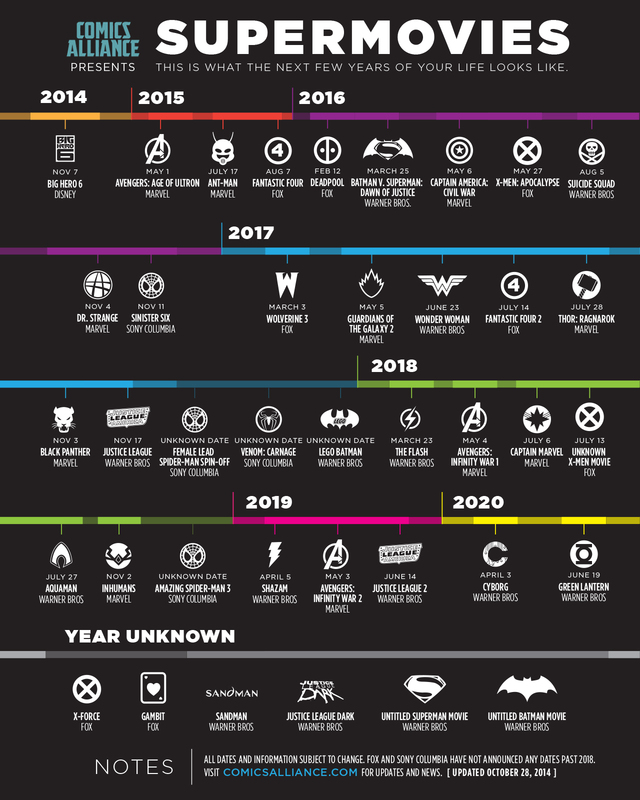 That’s a lot of superhero movies in the next 5 years…about 29 if you count the animated Big Hero 6 from Disney! There’s already speculation about superhero fatigue, superhero overload, comic book bubble, etc. but as long as the movies tell good stories, I don’t think superhero movies will become a bust anytime soon. I do hope, however, that these movies won’t fuzz the line between good and evil. What makes superheroes so attractive among any generation of children (and yes, adults) is the draw that bad things get their just reward and good will prevail. It brings out hope. There’s enough despair in the real world that we don’t need to see despair in our entertainment. Superhero movies are escapist forms of entertainment. Talk of superheroes dying in future movies is cause for concern. The superhero bubble will burst if the good guys don’t win in the end. If they do win in the end, then bring on all 29 superhero movies! Before I start, let me say that I am not your typical movie critic who loves bashing movies. I actually am less critical than most people. Maybe I have lower standards. Maybe I’m too forgiving. Or maybe everyone else is just too picky. So when I say Pompeii is a below-average movie, it must be genuinely below average. Some critics likened Pompeii to Titanic in that (1) both films are disaster epics, with the volcano in Pompeii standing in for the iceberg in Titanic, and (2) both films features a poor young man who wins the heart of a rich girl who is engaged to a bad guy. The 3D is gorgeous. Many scenes were shot in 3D and such scenes are a feast for the eyes. Adewale Akinnuoye-Agbaje is fantastic as Atticus, a warrior trying to win his freedom who ends up befriending Milo. The visuals in general are grand, from the coliseum to the city of Pompeii to the special effects when Vesuvius blows its top. Emily Browning does a fair enough job as the heroine Cassia. 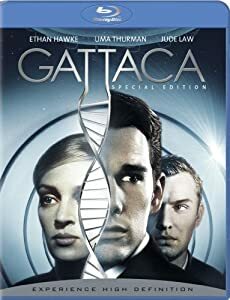 Although there is some sexualization of teens in this movie (as Cassia sometimes bares cleavage, and also is forcibly betrothed to Corvus—who is old enough to be her father), the engagement relationship of the older Corvus and young Cassia is shown in a negative light. According to scientists, the catastrophe parts are historically accurate except for the lava bombs and titanic tsunami. The movie starts by showing how the evil Corvus slaughtered a little kid’s family and town. I guess I’m dense but I thought the kid was a girl because of the little child’s long hair. This was confusing later b/c I couldn’t figure out what happened to that little girl…I actually wondered if she become Cassia. Well, turns out the “girl” was really a young Milo. The filmmakers should have followed the visual cue from 300, another gladiator pic, where young boys had short hair so there is no misunderstanding. Kit Harington does a poor job with Milo. His buff body would give Gerard Butler in 300 a run for his money, but Harington’s acting is terrible. He appears to only have one expression the entire movie, whether he’s sad, pensive, in love or angry. A highly predictable yet unbelievable scene shows a lifeless Corvus after the coliseum collapses from a volcanic tremor, yet when Cassia’s father attempts to kill him, Corvus suddenly is awake and super-strong, preventing Cassia’s father from killing him. I know it’s a movie, but you can’t go from unmoving (after a coliseum roof falls on you) to awake and mighty in the blink of an eye. I am happy to suspend my disbelief for these types of movies, but come on now. Character development took a big backseat in the movie. Do we know anything about Milo besides the fact he wants revenge for his family’s slaughter, and that he can fight? And how did Milo get to be so good at fighting? Does he have a plan to escape? Atticus tells us his plan for freedom, but we get nary an idea what’s running through Milo’s mind. And do we know anything about Cassia besides the fact she visited Rome and was glad to leave there? The love relationship between Milo and Cassia is superficial at best. Yes, Milo proves to be a horse whisperer of sorts, but nevertheless, their attraction to each other is purely based on each other’s looks. Cassia knows nothing about—nor seems to care to investigate—Milo’s past or his general character before falling in love. And Cassia is from the same nation (Italy) that killed Milo’s family in Britannia—yet we are not told why Milo apparently overlooks that fact, despite being in revenge mode. But by far, the biggest problem with this movie is that (warning: spoiler alert… skip this paragraph if you intend to watch the movie…last warning) …yes, easily the biggest problem with this movie is that everyone dies. Milo and Cassia handcuff Corvus in their final battle and let him get burned to death by the oncoming lava/firestorm, yet Milo and Cassia suffer the same fate of being burned up as the bad guys did. The official press release trumpets Milo’s attempt to save his beloved, which seems to imply that he will save her…that he and Cassia are the only ones to make it out alive. But despite their repeated evasions of death, eventually they still die the same way all the evil people did. Since this film is clearly historical fiction (like Titanic), a more hopeful and endearing movie would have had at least one (or both) of them survive, as the fictional Rose did in Titanic. In the end, you ask yourself, what was the point of following these characters and hoping they make it? Records indicate that many people did in fact escape…so why not the hero and/or heroine? That’s just plain dumb. I love, love, love disaster movies, dating back to when I saw Twister on the big screen. On the big screen and in 3D, disaster movies are SO cool to me. I guess it reminds me of the book of Revelation, how fragile man’s life is, how full-scale disaster is coming, and how awesome God is since He controls disasters. But this movie, while grandly showing the scale of the disaster of historical Pompeii, also grandly flops in its storytelling attempt of the human element of the film. ‘Amazing Spider-Man 2’ all dressed up and…ready to fail? Like most, I was a fan of the first two Spider-Man movies by director Sam Raimi. The CGI seemed a bit obvious at times when Spider-Man was jumping and swinging on occasion, but overall was acceptable. The story had some heart along with the action. But before the release of Spider-Man 3, I predicted the movie would fail. Not necessarily from a monetary standpoint, but as a movie. Spider-Man 3 had way too much going on. Gwen Stacy (Peter Parker’s first true love), Harry Osborn as the New Goblin, the Sandman, Venom, Parker’s ego struggle as a result of the new black suit, his attempt to propose to Mary Jane…that’s enough for at least five movies! Any film student will tell you that the more elements you add to a story, the more difficult it is to get much depth of any of them. A “jack of all trades, master of none” kind of thing. Sure enough, fans and critics alike loathed the movie. 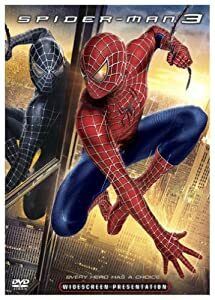 On Rotten Tomatoes, only 63% of critics liked Spider-Man 3 and even fewer moviegoers (54%) liked it—a steep drop from the 93% critic and 81% audience rating for Spider-Man 2. I didn’t like it either, despite making the effort to see it in the theater rather than wait for the DVD. The dislike for the film was so strong that fans actually demanded an apology from Raimi—even two years after Spider-Man 3 came out in theaters! And Raimi, to his credit, did admit it was too much crammed into the movie. But in an interesting interview before Spider-Man 3 was released, Raimi revealed that the original Spider-Man 3 story was just to have the Sandman as the villain. That would explain why Venom and Gwen Stacy are minor characters in the film. Gwen Stacy could have been substituted with any female character since her role as Peter Parker’s first real love interest isn’t on display in the film. And Venom is more of a sidekick to the Sandman (restraining Spider-Man while the Sandman delivers the blows), rather than a lead villain character. I’ve recently found out that Amazing Spider-Man 2 is following the same tragic movie formula as Spider-Man 3. ASM2 will introduce Mary Jane Watson (in a minor role) and Harry Osborn, with Electro and (supposedly) Rhino as villains. So let’s see: both Spider-Man 3 and Amazing Spider-Man 2 will have some sort of love triangle, an Osborn, and two villains. Maybe ASM2 director Marc Webb, who is reportedly going to start production this month, should get his apology ready beforehand.